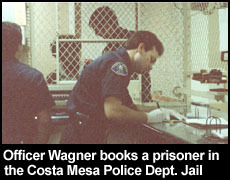 Jim Wagner was hired as a corrections officer for the Costa Mesa Police Department Jail in December of 1988. He would work there for two years until he was hired as a police recruit to go through the police academy and then go on as a full-time, paid, sworn police officer. The Costa Mesa Jail was a temporary holding facility for all crimes committed in the city of Costa Mesa; a population of just under 100,000 at the time. The patrol officers would arrest offenders, bring them into the jail, and hand their prisoners over to the jail staff for booking and housing. Prisoners could be incarcerated up to 72 hours, while trusties could serve their sentences up to one year at the facility. The Costa Mesa Police Jail had four felony and misdemeanor cells (16 beds), two solitary confinement rooms, a drunk tank, two interview rooms, one visiting room, a trusty quarters (6 beds), two booking cages, and a secured sally port. The morning shift consisted of two corrections officers, the evening shift staffed three corrections officers, and the graveyard shift had two officers. At any given time the ration of prisoners to guards could be 25:2 or 25:3. Although violence in the jail was not a nightly event, it was a weekly event. Prisoners would come into the jail drunk, under the influence of controlled substances, or angry. 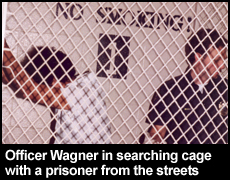 Officer Wagner had been assault by prisoners and several occasions, which is documented. One trusty in for drug trafficing put out a contract on Officer Wagner�s life, and on another occasion Officer Wagner prevented the escape of a prisoner who had assault a fellow correction officer on July 4, 1990. In yet another incident a prisoner refused to exit his cell who was scheduled to be transported to court tried to injure Officer Wagner by shoving his head against a metal bunk bed rail, but fortunately Officer Wagner only impacted his shoulders. Officer Wagner was able to fight the prisoner off, escape from the cell, and get to his partner who was securing the dayroom cell door. �The second most important lesson I learned working in a jail was to always be on guard and be ready to fight at any moment. Many prisoners would act very compliant, and then a moment later they are trying to take your head off. Like a water faucet I learned to turn on and shut off violence� Officer Wagner said. When Officer Wagner worked in the Costa Mesa Police Jail the corrections officers were not armed with any weapons: no pepper spray, no batons, no tasers, nothing. 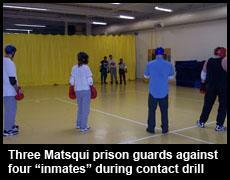 If a prisoner wanted to attack a corrections officer the fight would be hand-to-hand. Even though there were �panic buttons� along side of the walls spaced out every several feet, activating one would not get you help until one to two minutes. The watch commander in the police station had the only key to get into the jail, and that took a bit of time to get it, gather up some police officers, and storm the jail. Officer Wagner only hit the panic button one time in his career, and that was when a man on PCP (Phencyclidine), is a very dangerous hallucinogenic drug inducing strong neurotoxic effects, such as super human strength. A police sergeant and Officer Wagner tried to restrain the violent inmate but could not do it. The sergeant, who was a 6-4, 225 pound body builder, tried to apply a carotid hold on the man�s neck, but to no avail. As the sergeant and Officer Wagner were starting to get exhausted Officer Wagner kicked the panic button with his foot. Although Officer Wagner enjoyed working in the jail he wanted to expand his career by applying as a police officer, which he obtained. 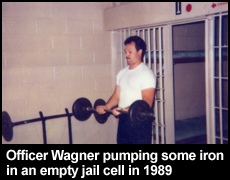 Even though Officer Jim Wagner was a corrections officer for only two years (1988 to 1990) he continued to train corrections officers all across the world to be safer in their jobs, and continues to do so to this day. 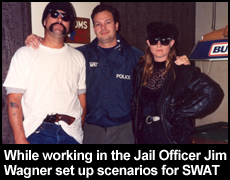 Jim Wagner worked closely with the California Department of Corrections for many years, taught a few times for the British Columbia Sheriff�s Department, helped create a training program for the San Diego Sheriff�s Department Prisoner Transportation Unit, worked several times with the U.S. Marshals, as well as with other sheriff and police departments. 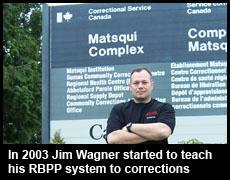 Upon creation of the Jim Wagner Reality-Based Personal Protection system on January 21, 2003 his first teaching contract was with the Matsqui Prison in British Columbia, Canada. He also trained the instructors of their Emergency Response Team. 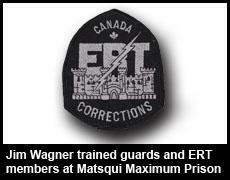 Over the last several years Jim Wagner has trained instructors from various European correctional institutions. Courses include Defensive Tactics for Corrections Officers, Knife Survival, and Special Operations for Corrections Officers.